St. Patrick’s Athletic and DCU midfielder Jamie Lennon this week was a part of the Republic of Ireland U21 training camp. The call-up to the first squad, named by new manager Stephen Kenny, meant that the 21-year-old missed out on representing DCU in the Collingwood Cup this year. “Obviously I’m absolutely delighted to get called up. I don’t think that there is any bigger honour than representing your country, no matter what sport or level it is at,” Lennon told The College View. “Growing up it’s something I’ve dreamed of doing so to do it at this level is something I’m very proud of and will motivate me to take my opportunity and show what I can do. “Unfortunately the call-up will affect the Collingwood as they are both taking part on the same days. “Although I would love to represent DCU in this great tournament one last time, I feel this is an opportunity I simply cannot turn down,” Lennon said, speaking before the tournament began. St. Pat’s are now under the management of Harry Kenny, who was appointed manager in October, following Liam Buckley’s resignation in September. The call-up for Lennon came during his pre-season preparations with St. Patrick’s Athletic. Former Bray Wanderers manager Kenny has made a number of signings in the off season, most notably Chris Forrester on a three-year-deal from Aberdeen, Rhys McCabe and Mikey Drennan from Sligo and Brandon Miele from Shamrock Rovers. Pre-season so far has seen the Saints rack up wins over Bray Wanderers, Cobh Ramblers and an FAI ETB side. “It’s been a really tough pre-season. Our main objective is to get as fit as possible before the season starts, to get to know the new additions to the team and develop our style of play,” Lennon said. Lennon signed his first professional contract with the Saints in December 2017, ahead of the 2018 season, having previously been a regular for their U19 side. His senior debut came in 2017 in the Leinster Senior Cup, as did his first senior goal for Pat’s, in a cup tie against Firhouse Clover. Lennon will be competing with the likes of Chris Forrester, Rhys McCabe, Georgie Poynton, Cian Coleman, Conor Clifford, Brandon Miele, Darragh Markey and James Doona for a starting position in midfield. “There’s definitely a lot of great competition in midfield, but we’ve got competition all over the park, from goalkeepers to strikers, there is quality across the pitch,” Lennon explained. “It’s healthy. It’ll add great depth to the team that will be needed throughout the year, things like injuries and suspensions are inevitable, so it’s essential we have quality players that can do a job when called upon. “This has to be the way if we want to achieve anything this year. Along with that, playing with players of this quality will only improve me as a player. “I’m still only young and I’ll learn off them and continue to get better, my development will certainly benefit from it,” Lennon said. Pat’s finished fifth in the league last year, on 50 points, a nine points behind fourth placed Waterford, and Lennon was named their Young Player of the Season for 2018. Looking ahead to 2019, he hopes Pat’s are pushing for the European spots, having finished just a place outside the spots last season. 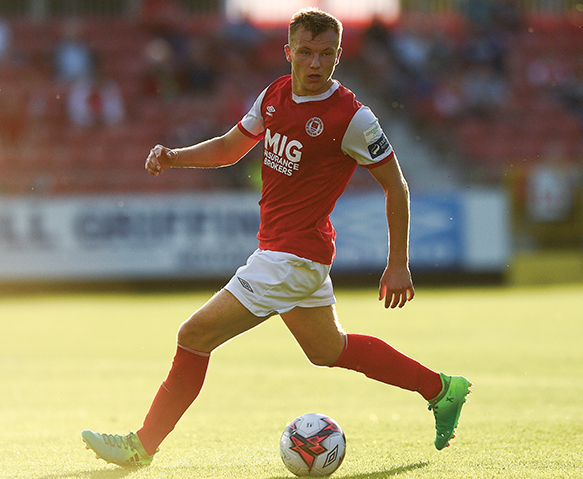 St. Pat’s last European adventure came in the 2016-17 Europa League when they faced Jeunesse Esch of Luxembourg and Dinamo Minsk from Belarus. The Saints, then managed by Liam Buckley, beat Jeunesse Esch on away goals. They had won 1-0 at home before losing Esch 2-1 away from home in Luxembourg, as Darren Dennehy’s second half goal proving enough to send Pats’ through to the next round. St. Pat’s then went on to play Belarusian side Dinamo Minsk in the second qualifying round, narrowly losing 2-1 on aggregate as they drew 1-1 in Belarus before losing the home tie 1-0. “Last year is behind us now. On a personal level I really enjoyed it and learned an awful lot, but I feel I’m ready to step up to another level this year. “Like every club in the league, we want to be successful. The new signings will certainly help that so hopefully we could push on up the table even further than last year. “A club of this stature should be playing in Europe and that’s what we want to bring back to Richmond,” Lennon said. Manager Harry Kenny also spoke of his hope of Pat’s returning to the top four in the 2019 season when he took the job back in October. In an interview posted on the club’s Facebook page, Kenny explained how he hoped that a mix of the players already signed at the time, and his own new signings, would hopefully bring the club back up to top four spots and back into European football. As for Lennon, the midfielder is now in the final semester of his final year of college but is determined to do well in his summer exams, to have a degree to fall back on. “I don’t set too many personal goals for myself. I’m in my last semester of college. “It can be tough to balance both football and studies but I’m determined to do well in my summer exams and have a degree to fall back on if needs be,” he said. “Finishing college will be something I’ll be very proud about so I suppose that’s one goal I’ve set for myself. “Apart from that it’s just to keep working hard in training everyday. “We’ve got a really good squad here in Pats and I want to play a vital part in that this season, so I’m looking to push on and if further international call ups come my way, great,” Lennon said.